Not much is known about the purpose of this 7-inch marigold bowl. 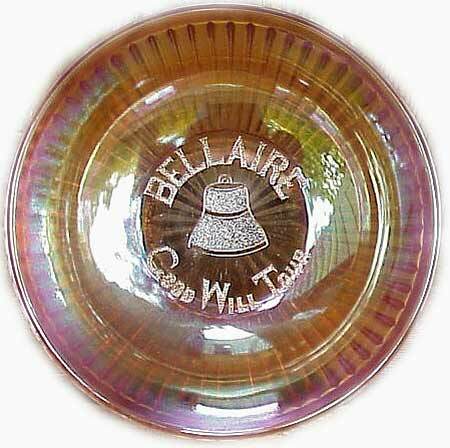 The best information about the purpose of these bowls is that they were commissioned as a souvenir of a tour sponsored by the Chamber of Commerce of Bellaire, Ohio. The bowls are quite scarce and seldom come up for sale so establishing a value is problematic. The only auction prices known are $90 in 2009 and $20 in 2011. Thanks to Neil Panciera for the photos.